A toggle hand press is an hand operated affordable and easy-to-use eyelet assembly machine, designed for low to medium volume eyelet assembly. 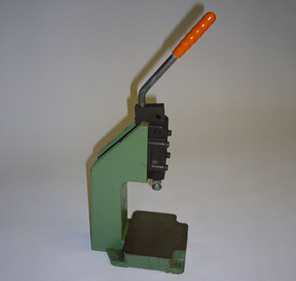 Depending on your needs, we can supply the hand press on its own, or mounted to a bench for easy manual eyeletting. A full range of tooling solutions is available to suit all Bodill Parker eyelets – stainless steel, solid brass and other finishes, and in both standard and custom sizes.